This article contains all of the ICOs that have completed their fundraiser and succeeded in fulfilling their expectations. Out of 32 ICOs ending in this first week of September (01.09 to 07.09), only 12 succeeded, which indicates a 37.5% success rate for ICOs ending in September. Projects have variable start dates. The total investment ending in the first week of September was $21,274,569. For more details, you can look at the specific projects in the list below. Welcome to the first article that highlights successfully completed ICOs. Our goal is to create this type of article every week for the month of September, and if it is well accepted by the community we will continue to create informative content like this for all of you ICO hunters and new coin enthusiasts. If you would like to get your ongoing ICO featured on Crypto-News.net feel free to send an email to our advertising department. The list is ordered according to the amount raised (top to bottom) and every ICO gets a short introductory description based on their own marketing material. This is not an endorsement to purchase their tokens on an exchange, nor Crypto-News.net is in any way affiliated with these projects. Some projects did not have their information up to date, which means that either their ICO was ongoing when checked, or their investment functions were not shut down. For these cases, we simply state the amount raised and explain why their brand is not featured. We feel a responsibility towards you to thoroughly check and compile these lists in a way that is safe. Websites that are not updated to reflect the closure of investments are seen as risky and unprofessional. The data presented for each ICO originates from ICOBench for this article. For the next articles, we will consider featuring a different ICO tracker to keep things fair and balanced. IXTUS an edutainment project which is designed to help children discover their interests, capabilities, and talents. The platform promises to create a way to drive curiosity and promote the natural drive for attaining knowledge. It combines problem-based learning, questions and answers, exploration, and active discovery to reach their goals. Their first product will be called “Little Detective” and they’ve been working on it for three years prior to starting the ICO. It will help children between 3 and 8 years old to develop process-level thinking through learning experiences. The token will be used as a utility within the platform and to commercialize content from teachers participating on the platform. They want to create an educational marketplace where parents can control the type of content their children learn about. The project raised approximately $6,700,000 in their fundraiser, which places them on the first spot on this list. This ICO raised $5,118,271 for the duration of their fundraising campaign. Brand details are not added due to fact that token sale was open and encouraged at the time of writing (when it should be closed according to data the project provided to ICObench). How they reached the second spot is beyond me, but considering the circumstances I really can’t give you any more information. ICO raised $3,700,000 for the duration of their fundraising campaign. Brand details not added due to fact that private sale and discounts are encouraged on their homepage. This places them on the third spot, and I would love to tell you more, but that would put you, the reader at risk. Nagricoin is a very interesting project which finds its roots way back to 2011 (before the end of the world was supposed to happen, remember that? ), and they are based on top of a very real part of the agricultural industry. Fertilizers are their specialty and their product Nagri-HL (according to their marketing) is an advanced product that has demonstrated an increase in yields and quality of any crop it has been applied to. 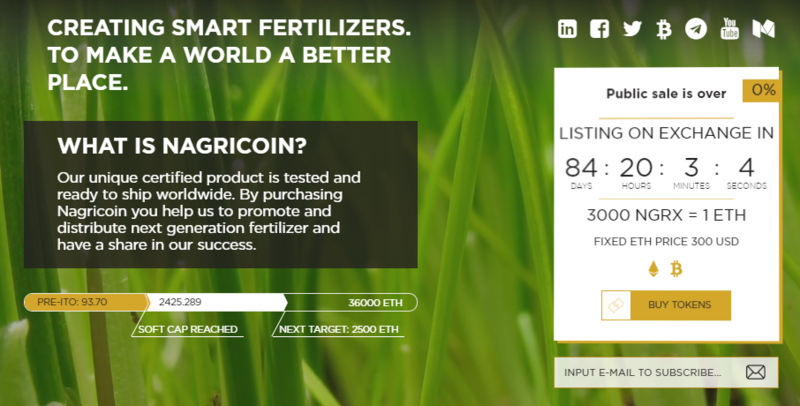 They expect their token to find a wide utility in the agricultural industry around the world. Investors have planted $1,718,000 in their green thumbs to fulfill their vision, which places them squarely on the fourth spot on this list. This ICO raised $1.5 million in their first round, but we cannot feature them in this article because they are going to have additional rounds in the future. Fifth place goes to this anonymous fundraiser. Created to motivate players to keep playing mobile games for an extended period of time. That also keeps developers and investors happy, because they will be able to create marketable audiences. The players come for the game, but stay for the tokens. The time they spend playing the games is used to mine this cryptocurrency. Hopefully, they have some fail-safe protocols to protect against people having random phones open in their apps just to mine the currency. Players will be able to join mining pools, and the currency is expected to have variable mining difficulty. For their ICO they managed to raise $1,258,530 which will be used to facilitate the development of their platform. The cryptocurrency itself will have 500 billion token limit, which is a sizable amount. Due to the mining elements, the developers believe this will lead to a long-term appreciation of the token i.e. good news for investors. That places them at the sixth place on this list of ICOs finishing in the first week of September. Based in Vancouver, Canada, CoinSeason is a Fintech startup that initiated their operations in August 2017. They are a regulated cryptocurrency and trading platform which did not accept investors from Canada. We find that weird and strange, but they managed to raise $1,256,687 regardless of the fact that they are both governments supported and don’t accept investors from their own country. CoinSeason is a part of Volctech Blockchain Incorporated and is hosting both an English and Chinese interface. According to the marketing, the company (CoinSeason) is not only involved in the cryptocurrency exchange business, but also provides blockchain implementation, smart contracts, ICO issuance, and mining. Finding itself on the seventh spot is not bad, but we really don’t get it. Genesis Space is an interesting gem from this list because it is a DAO that acts as a platform i.e. similar to Distr0x and Ethereum. Users can generate side chains on demand and enforce their own rules for their chains. The community is the leadership and the model is purely democratic which means that every change must be voted through. They consider sidechains as countries, separate countries from the main chain, and they see them as a means to scalability. The team is coming from a strong engineering background working with companies such as Google, eBay, Oracle, and Alibaba, as well as high standing universities such as Harvard, Berkeley, Columbia, CMU, and CUHK. For their ICO they managed to raise $576,260 from investors in order to fulfill their vision, an amount that places them on the eight spot of this list. This project did not update their ICObench listing, but according to the website they had raised $467,396. We cannot verify the authenticity of the information at this point, but the ICO is actually ending in October. For now they find themselves on the ninth spot, and maybe if this article series continues we will feature them in October. With a goal to revolutionize the monitoring industry through blockchain tech and smart contracts, the Path Network generated $285,745 through their fundraiser. This places them on the tenth spot on this list. They want to have user-powered monitoring nodes which collect data from powerful analytic tools, to provide a global coverage and insight for online business owners. Their solution provides additional power and information for website, application, and network analytics. Path Network’s product is working and they have a business model which helped them achieve this successful story. Even through they find themselves near the bottom of the list, even being on this list means they’ve achieved something. This project raised $145,000 for the duration of their ICO. The homepage was not updated and the ability to invest more was open to consumers. This result places them on the eleventh spot on this list. This ICO still had their token sale open when we were writing this article they managed to raise only $94,880 for the duration of their fundraising campaign. Homepages that are not updated after the ICO ends with capabilities for readers to purchase tokens are a liability. The project could be abandoned or fraudulent, so we will not provide any sort of publicity for them. This project cannot be considered a success, mainly because of the weak value prepositions. I only hope they will refund investors, because I’m pretty sure somebody somewhere is feeling pretty sour about his decision to invest in this project. Give us support in the comment section if you enjoyed this series. All of the ICOs that found themselves on this list have achieved some success, but as we can see there are heavier projects that investors have entered with great certainty. This should give hope to ICOs and hopefully we can see better attempt rates in the following months. It is truly sad when ICOs suddenly decide that there are “unfavorable market conditions” and decide not to go through with their decision to have a fundraiser. That is probably very good for investors, because the companies are showing themselves and say “We can’t really stick to a decision”. It is understandable to have negative expectations about adoption, but it should not stop entrepreneurs and their team to go through with their decisions. If you change your mind once, you are likely to do it again, and investors do not like that. If you enjoyed this series and want to see more, comment below and show us your support to continue moving in this direction.